The nose doesn’t stop growing and changing until age 16 and it is, therefore, inadvisable to consider surgery before this. Comments from some previous patients are shown near the bottom of this page. To change the shape of the nose, the underlying bone and cartilage need to be adjusted. Small cuts are made on the inside of the nose alone (closed rhinoplasty) or with an incision in the skin under the nose (open rhinoplasty). This allows the surgeon to reach the bone and cartilage under the skin and to reduce or reshape the tissues as required. The bridge of the nose, the nostrils and the tip of the nose can all be adjusted. In some situations areas of the nose need to be built up. This is known as an augmentation rhinoplasty, using bone, cartilage or synthetic materials. Bone can be taken from another area of the body such as the hip or ribs. Cartilage may be taken from the ear or from another part of the nose. Many cases are performed under a general anaesthetic which means that the patient is asleep during the procedure. In some situations a local anaesthetic can be used which means that the patient remains conscious. Some light sedation might also be used in this situation. It may be possible to have the surgery as a day case, avoiding the need for an overnight stay in hospital. For more extensive surgery, some patients may need to stay for one or two nights. If you decide on surgery you will be required to undergo some simple health checks and photos will be taken to record the shape of your nose before surgery. You will be asked to sign a consent form giving permission for the operation. This requires that you are aware of the risks and complications involved with the procedure. You will probably need some simple painkillers such as paracetamol to help with any discomfort. There will be a splint over your nose which must be worn for up to two weeks. You will also have packs in your nostrils and you will need these for a few days. This means that you cannot breathe through your nose. You should expect that it may also be difficult to breathe through your nose at first, even after the packs have been removed, due to swelling. It is normal to experience minor bleeding from the nostrils in the first few days. This should simply be dabbed away. You must avoid blowing your nose and you will be advised not to have hot baths as this can increase the risk of a serious nose-bleed. There are general risks associated with a general anaesthetic including chest infection – especially in smokers. Deep Vein Thrombosis (also known as DVTs or clots in the veins of the legs) can also occur which can break off and travel to the lungs (also known as a pulmonary embolus) which can, although very rare, be life threatening. There may not be perfect symmetry between the two sides of the nose after the surgery – especially in cases where there is pre-existing asymmetry – and this may not be correctable by further surgery. Bleeding, particularly heavy nose bleeds, can happen shortly after the operation or even up to 10 days later. This may require hospital treatment. Infection may require antibiotics and if any synthetic / graft material has been used to build up the nose, this might have to be removed. 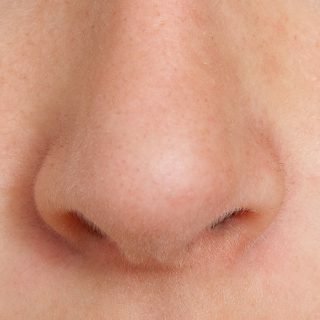 Specific to rhinoplasty, it is possible that there may be altered sense of smell after the operation or difficulty breathing through your nose. Surgery involving the nasal septum can be complicated by haematoma, infection or perforation of the septum. In a few cases these problems can be permanent. The sensation in the skin of the nose may also be changed and in particular the tip may feel numb. The tip position, nostril arch shape and width can be changed by surgery. Even after surgery, some patients will be dissatisfied with the outcome and a second operation may be required to make adjustments – in some cases, it may be unwise to pursue further surgery. The size of your nose and nostrils and need for a clear airway may limit the amount of adjustment that can be realistically achieved. You should discuss your expectations and the limitations of the operation with your surgeon before the operation. The shape of a person’s nose is largely an inherited characteristic. The shape is determined by the bone and cartilage which make up the skeleton of the nose, over which the skin is draped. Some people are unhappy with the size or shape of their nose. Injury can also lead to an unsightly appearance. A rhinoplasty can help in all of these situations. However, rhinoplasty is not an effective treatment for snoring, nasal obstruction or for sleep apnoea. The nose doesn’t stop growing and changing until age 16 and it is, therefore, inadvisable to consider surgery before this. Comments from some previous patients are shown near the bottom of this page. You should consider a surgeon who has undergone a full training programme which includes facial cosmetic surgery. These surgeons will be on the Specialist Register at the General Medical Council and may be a specialist Facial Surgeon (Maxillo- Facial) – a specialist in facial surgery (hard and soft tissue, reconstructive and cosmetic), Otolaryngology Head & Neck Surgeon – operating on the ears, nose, throat, sinuses or face – or a general Plastic Surgeon – operating on multiple areas such as the abdomen, breasts, legs, arms, groin and faces. You can ask the surgeon if they are registered as a certified cosmetic surgeon with the Royal College of Surgeons of England for rhinoplasty. Members of organisations such as the Association of Facial Plastic Surgery (AFPS), British Society of Rhinoplasty Surgeons (BSRS) or the British Association of Aesthetic Plastic Surgeons (BAAPS) are generally on the Specialist Register and have a special interest in cosmetic surgery. You may consider it important not only to investigate your surgeon’s qualifications and speciality training, but also – ask what anatomy they spend most of their week operating on! Occasionally, it is helpful to direct a patient to a specialist who is sub-specialised in one particular area of concern.